The Adoption Institute's protesting the new horror movie Orphan because they believe it's negatively influencing would-be parents. But frankly if someone goes ahead and adopts one of these soulless dead-eyed kids who weeps blood, they're pretty much asking for it. "We are concerned that in addition to its intended entertainment value, this film will have the unintended effect of skewing public opinion against children awaiting families both in the United States and abroad. 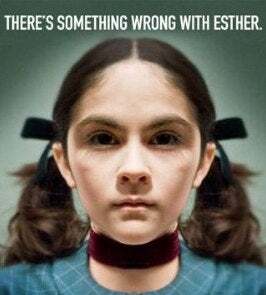 Evil Esther and her sinister lines such as, "It must be hard to love an adopted child as much as your own," have certainly pissed off a lot of people. Some adoption agencies have even suggested boycotting the film. Which (in my mind) is like candy shops suggesting the boycott of Willy Wonka. Can they hold a Bible without it burning their hands? Do they make the walls bleed? Do they refer to themselves as we? As in: "We want to take the cat swimming, we can't reach the matches, we want to play with baby brother alone in in the tree house." It is not a depiction of any real-life events or situations and has never been portrayed as anything but an entirely fictional story. We apologize if we appeared insensitive with the initial trailer, as it's never our intent to offend anyone with our products. In other words it's a movie. And movies are not real. These must be the same kind of people that think they can drink gasoline and turn into a Transformer. Come on people.